I can safely say that my favourite reading genre is YA contemporary. I never tire of Meg Cabot, Stephanie Perkins, or John Green, and if someone recommends a YA contemporary novel to me I immediately add it to my wish list, usually without even bothering to read the reviews on goodreads. I thought I might grow out of it at university and develop a taste for more literary genres but I was wrong. I only left university with even more of an appreciation for YA contemporary than I had when I got there. I even wrote my dissertation on it. I don't think there's anything wrong with having a favourite reading genre. I don't think there's even anything wrong with choosing most of your reading from that genre. That's what genres are for. They exist so that we can easily find books similar in theme and subject to the books we already like. And reading should be fun and enjoyable so if you have a genre that you know you enjoy, why not look there first when you're trying to find something new to read? 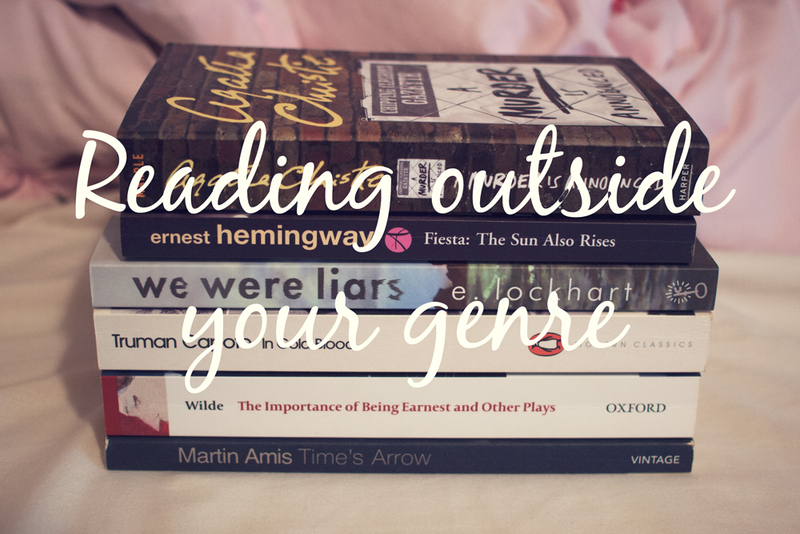 However, I also think it's never a bad idea to explore books outside of your favourite genre. If you're a writer, it's essential to experience books from all sorts of genres, so that you can see the common threads of how stories work, and even if you aren't a writer at all I still think that's important for readers. Reading outside of your favourite genre can open up a whole new world of stories you'll love but might otherwise never have known about, and it can also help you to appreciate your own favourite genre more. There are certain aspects of storytelling that are present in any and every type of genre, and there are other aspects that you will usually only find associated to one, and both of those things can help a reader better understand and appreciate the stories they're already familiar with. Even if contemporary is your thing and you try your hand at fantasy only to discover you don't like it, the contrast could just make you love your contemporary novels even more, so what is there to lose? What do you think? What's your favourite genre? And how often do you branch out from it to read new things?